I really like this still, and having already Glamour Started Olivia DeHavilland some weeks back, it didn’t seem right to hold a captivating wartime image like this until her next featured posting. It’s those grease spots that really set this off, don’t you think? As I look at it, I wonder if she’d have any recollection of going out to the airfield for this session. Probably not. After all, it’s been over sixty years. 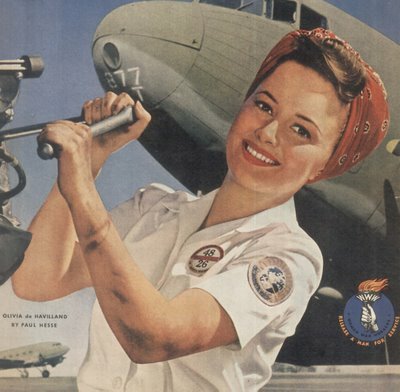 Factory, munitions, and mechanic work were much needed during WWII, and there were no more persuasive recruiting tools than beautiful stars posing with tools of those trades. This photo, by the way, was taken during that period when Olivia was embroiled in her legal challenge against employer Warner Bros., wherein she sought release from her oppressive contract. As you’ll note HERE, she won.